Watch the Bank on Memphis training video to learn about what being a Bank On Memphis partner means and how you can help connect families in Shelby County to safe, affordable banking opportunities. There are two ways Bank on Memphis clients can earn a Bank On Memphis Certificate. The first way is by attending a in-person financial literacy workshop through any of these programs: Project HOME, Bankruptcy Financial Education Class, RISE Foundation's Financial Education Class,Operation Hope's Financial Workshops, or Advance Memphis's Managing Money Course. 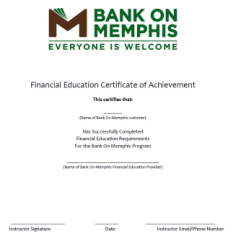 The second way a Bank On Memphis client can earn a certificate is through the Bank On Memphis online financial education workshop. Once Bank On Memphis participants have completed a financial literacy workshop, they will bring either a printed or electronic copy of their certificate to a partner financial institution of their choice. Now they will be eligible to open up a second chance bank account! Click the images below to see what a Bank On Memphis Certificate looks like. ﻿Bank On Memphis is the first Bank On program to develop a mobile app to help better connect people to 2nd chance bank accounts. Download the power point to learn more about how Bank on Memphis clients receive a certificate of completion through their smartphone.